Settlement leaders are demanding that Israel deport American consulate staff who clashed with settlers Friday, according to the settler-affiliated news site Arutz 7. According to Yossi Dagan, acting head of the Samaria Regional Council, the council of northern West Bank settlements, US consulate security guards threatened settlers with a handgun and an M16 rifle. A confrontation broke out between security personnel from the US consulate in Jerusalem and settlers from the Ramallah-area Adei Ad outpost in the West Bank on Friday, after settlers hurled stones at two vehicles from the consulate. The consulate staff arrived to the area at the inviation of the village of Turmus Ayya to examine thousands of olive tree seedlings which were uprooted Thursday night. Some of the seedlings belong to Palestinians who are also US citizens. The Consulate security guards arrived at the agricultural lands to examine the scene and rule out any security risks, while the delegation members waited behind in the village. Settlers claimed they arrived to the area without coordination and brought Palestinians into their territory, saying the American visit was coordinated with the Israeli Civil Administration for next week. 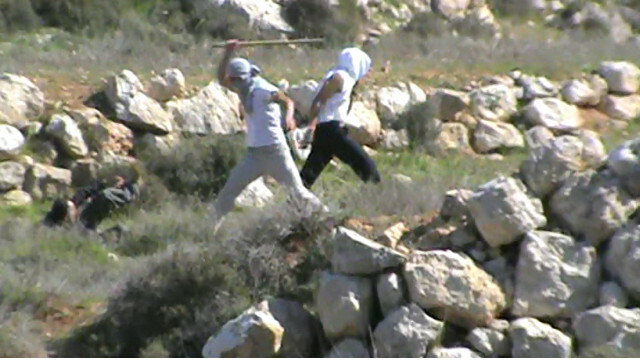 According to police, the settlers pelted the convoy with rocks. “I request that in view of the serious and criminal conduct, that these [US] security guards and officials be deported,” he added. A State Department spokesman in Washington said US authorities were “deeply concerned” about the stone-throwing incident. “We can confirm a vehicle from the Consulate General was pelted with stones and confronted by a group of armed settlers today in the West Bank, near the Palestinian village of Turmus Ayya,” said the US State Department spokesman according to AFP. Adei Ad is an unregulated Israeli outpost that was established in 1998 by a group of yeshiva students from the settlement o f Shvut Rachel. The settlement was established on land owned by Palestinians and is also considered illegal under Israeli law. In 1999 Israeli Prime Minister Ehud Barak ordered the outpost dismantled, although it never happened. On 10 December 2014, Palestinian Minister Ziad Abu Ein died in a confrontation with Israeli soldiers during a a protest march to plant olive trees on this site.